This soap looks just like a sandy beach. The luffa adds just enough scrub to make a gentle exfoliant and soap all in one! Place the silicone loaf mold on a cookie sheet. This will give the mold stability should it need to be moved. To large microwave-safe measuring cup, add 40 oz. of cut up soap. Heat in microwave in 30 second increments until melted. In a small beaker or container, measure 1.20 oz. of fragrance oil and 0.60 oz. of Vanilla Color Stabilizer. Mix together and allow to sit for 2 minutes. Add fragrance/stabilizer mixture to melted soap. Stir or gently whisk until well-blended into melted soap. Add 7 drops of Sea Blue-Green Liquid Color and 5 drops of Forest Green Liquid Color. Mix well. Place a bowl on top of a digital scale and tare to zero. Pour 16 oz. of colored soap into bowl. Add 8 Tbsp. of luffa powder and mix well. Pour into loaf mold and let set up. Cover remaining melted soap. We allowed the poured soap to start to harden. Using a spatula, we then shaped this soap so that it had a more uneven top. Spritz with rubbing alcohol and cover with remaining soap. Allow this to form a thin skin then top with Bath Water Crystals. Let soap harden. Slice and package in airtight wrap. To Use: Lather onto wet skin. Ingredient Label: Sorbitol, Coconut Oil, Propylene Glycol, Stearic Acid, Water, Sodium Hydroxide, Glycerin, Coconut Milk, Luffa, Titanium Dioxide, Fragrance, Green 5, Yellow 5, Sodium Chloride. "I am seeing in the ingredients list for this finished product Methylparaben and propylparaben, but I don't find it in any of the individual ingredients. Can you tell me what ingredient in this recipe contains these?" Staff Answer These ingredients are used to preserve the liquid colors. They are found in the two stained glass colors used in this soap. "On step five of the recipe, it says to measure the fragrance oil in one container and in another to measure out the vanilla color stabilizer plus .5 ml of something else. Is this .5 ml fragrance oil? Can you clarify please? Also, if you add to much vanilla color stabilizer yo the soap, will it have an adverse affect? Thank you :)"
Staff Answer We have updated this step to, hopefully, make more sense. To one beaker, measure 1 oz. plus 7 ml fragrance oil. In the other beaker, measure .50 oz. plus 3.5 ml of stabilizer. Then, mix together. Adding a little more stabilizer than is listed, will not affect the soap at all. "What other fragrances vanilla free could I use with this soap? I've got about 1 1/2 pound left I'd like to use a pink sea salt. I'm new to the soap making thing and don't want to make any mistakes." Staff Answer You can use any fragrance you wish in any of our recipes. We recommend just checking the vanilla content if you do not wish to use one with vanilla.
" Can I switch out the liquid dye and use Mica and label this as a natural soap?" 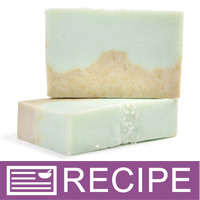 Staff Answer You can use alternate colors for this recipe but the soap base is not an all-natural product.